Note: The recipe and photographs for white wine taralli have been updated since their original publishing date in April 2016. White Wine Taralli are the perfect savory and crunchy Italian snack food. One is never enough! I guess I’m in the mood for crispy cookies these days. Last week I posted my recipe for biscotti and this week I decided to make a savory, crunchy cookie. Actually, I wouldn’t really call taralli cookies. White Wine Taralli are more like a breadstick. 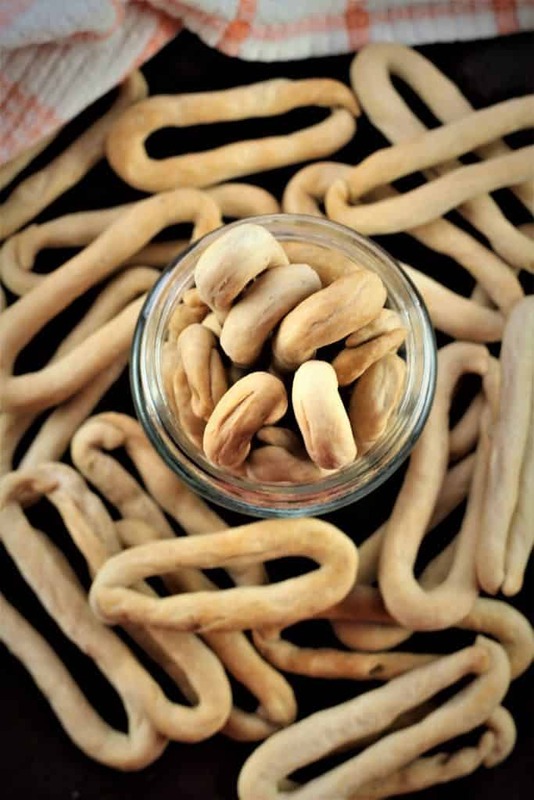 Taralli in general are typical of southern Italy. Like all Italian foods, several regions of the south have their own version of taralli with varying shapes and flavorings which include fennel seeds, black pepper and red pepper flakes. Taralli can be sweet as well with a sugar glaze on top. In Italy, they are often enjoyed with wine. These white wine taralli are not necessarily Sicilian in origin. My mother was given a recipe years ago which she has modified over time, and this recipe is the final result. 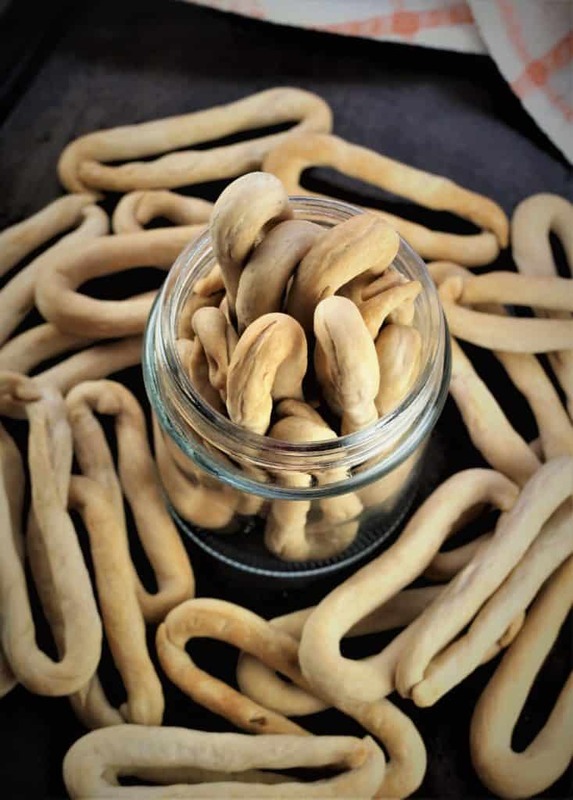 This recipe apparently started out as sweet taralli but gradually my mother transformed it into savory taralli by adding salt. Most taralli are boiled before baked but these are only baked. And that’s what makes them, in my opinion, so much easier to make! 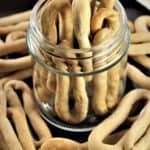 I also enjoy them with fennel seeds but I decided to share the recipe for plain white wine taralli. 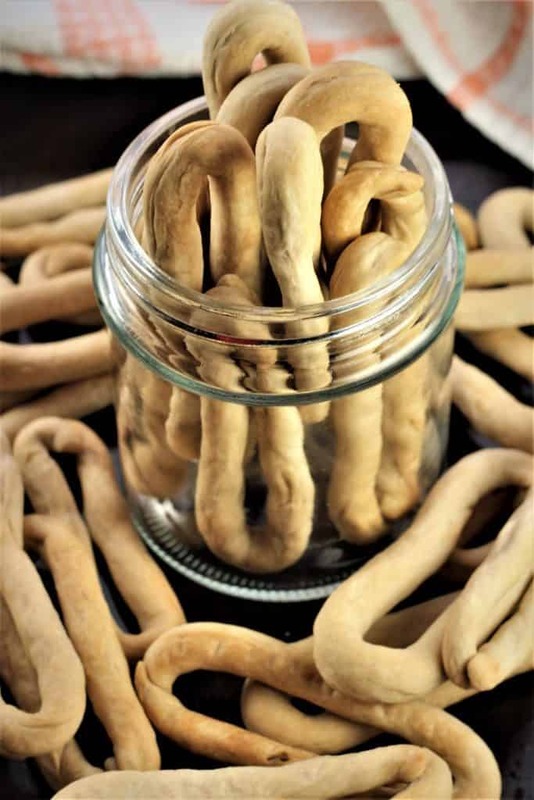 You can also vary the shape of your taralli from long and narrow, such as these, or bite size round ones. Taralli are the perfect snack food. My mother promptly provides me with a supply to take along each year when I go on holiday and my family and I enjoy them on the beach or poolside. We have made many friends! They are also indispensable when we go on long car trips. Since they are dry and crisp, they keep for a long time. 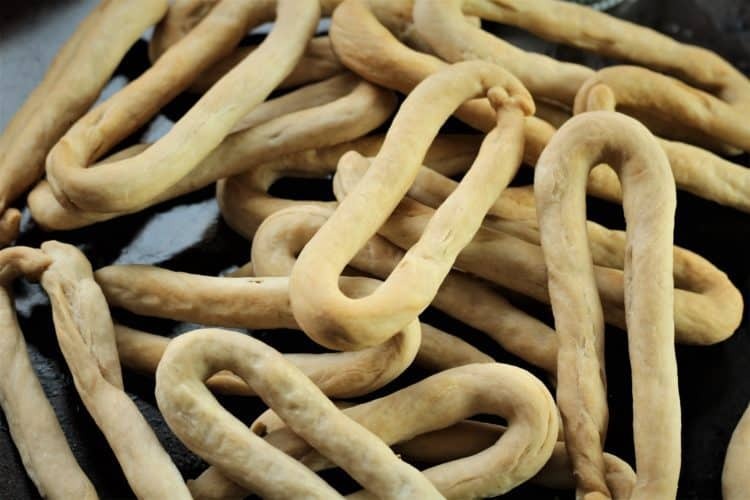 A taralli recipe is indispensable in every Italian household. If you give this recipe a try, please tag me with #mangiabedda on instagram and share your photos. Buon appetito! White wine taralli are the ultimate Italian snack! Make a well in the centre of the flour and add the white wine and vegetable oil. Using a wooden spoon, stir the ingredients together until a soft dough is formed. Turn out the dough onto a lightly floured surface and kneed gently until smooth. Divide the dough into 4 pieces. Each piece of dough will make 12 -2 inch taralli. Using the palms of your hands and applying gentle pressure, roll the dough into a rope of approximately 1 cm wide. Pinch both ends together to form a circle. Place each taralli on a parchment paper covered baking sheet. Bake for 30-40 minutes until lightly golden and crisp. OH Nadia! I've been looking for this recipe!! They're gorgeous! 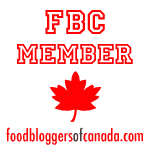 I've pinned this to make this weekend thank you! I'm glad you found it Lana! Thanks so much for sharing!